Following up from our earlier story, Vodafone have now confirmed the 3G V903SH for release in Japan during August 2005 and have given a few more details. As expected, this has a 3.2 megapixel camera with 2X optical zoom, a 240x320 pixel display, Bluetooth, miniSD expandable memory (64Mb included) and stereo audio playback. Sharp are proud of the display in the V903SH - instead of a normal TFT this panel uses Sharp's Advanced Super View (ASV) technology as used in their LCD TVs to give a clearer display with a wider viewing angle. At 2.4 inches diagonal size, the Sharp 903's display is significantly larger that the 703's but is the same resolution. Audio playback on the Sharp 903 is through inbuilt stereo speakers, and the V903SH comes with pretty much everything that the 902 did, including an MP3 player, full video calling, email client, web browser, even including an OCR (optical character recognition) program and a barcode scanner. In truth, it's not the world's biggest upgrade from the 902, although there are improvements all around in terms of both hardware and software features. As we said recently, the biggest gripe that we have is the switch to miniSD cards from the SD/MMC format which will probably just put potential 902 upgraders off. Still, the Sharp 903 / Vodafone V903SH is about the best specified clamshell format 3G phone on the market anywhere. 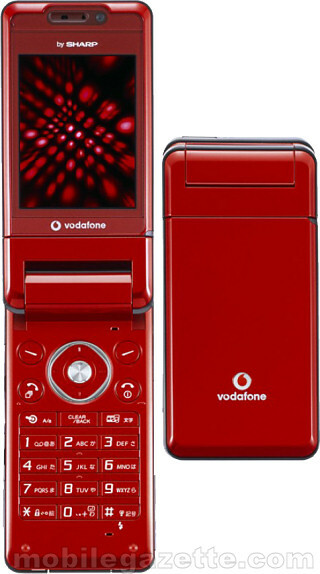 Slated to be available in August 2005 in Japan (in red, black and white colours), neither Vodafone nor Sharp have confirmed if and when the handset will be available in Europe.